Here I am again, at the gas pump, trying to figure out why the price just went up thirty cents a gallon in the last month. I'm unhappy about it, and I'm just waiting for the other shoe to drop. Who knows why the price of gasoline skyrockets at any given time? It seems that the slightest event sends the price of petroleum through the roof. It could be a natural or man made disaster, or a political happening. You would think that, since the first oil crisis of the early 1970s, our society would have been working on solutions to the volatile nature of the petroleum industry. The problem is, the energy industry makes large profits whether the situation in the world is stable or not. It seems like the roller coaster ride is nothing more than business as usual for the energy providers in our country. We have all been there at the gas pumps after months of continuous hikes in the price, saying "there has got to be a better solution to our energy needs". The solution to our energy needs is actually quite simple in some regards. It is the hydrogen infrastructure, what I call Ekson Exhilaration. Hydrogen is the most abundant element in the universe. When hydrogen is extracted from water by renewable electricity resources like wind power and solar energy we largely remove the environmental equation from securing our energy needs and create a true home grown energy source. The big question is, if all the technology already exists for the creation of the hydrogen infrastructure, why haven't we built it? The answers are: money, and control of the energy sector of our economy. To me the issues of money (who is going to pay for building the hydrogen infrastructure) and control (who is going to own the hydrogen infrastructure) are of a societal nature. If our society wants to build the hydrogen infrastructure, it will have to start as a grass roots movement. The way I see it, we the people will have to pay for the building of the hydrogen infrastructure over the thirty to fifty year period it will take to replace the petroleum infrastructure. Our goal will be 60% completion in thirty years and 100% completion in fifty years. Now, here is the kicker. We will give this hydrogen infrastructure for free to the existing energy providers in our country. I know what some of you are saying: "No way. Never! Why should we give anything to companies that already make such huge profits?" I believe that unless there are major incentives, the energy providers will never leave the petroleum economy behind. In order for a profit-driven industry to make such a monumental change, from petroleum-based to hydrogen-based, we as a society have to guarantee a no lose situation during the thirty to fifty year time period of change over. Today's energy companies are stockholder owned, with just one mission. That mission is to make money as fast as possible with as little investment as possible. It is the charter of today's modern corporations, the reason they exist. This business model may be fine for the short run, but in the long run it does not work. Eventually more money has to be spent on exploration for petroleum. Infrastructure wears out and needs to be replaced. These costs are, of course, passed on to the consumer. Many economists and most scientists have said the world is on the downhill side of peak oil, meaning that easily accessible oil is gone. This was driven home by the British Petroleum disaster in the Gulf of Mexico in 2010. Many Americans did not realize just how far out in the ocean the drilling platform was. It was 250 miles southeast of Houston. They also did not realize just how deeply the petroleum companies were drilling. They were down 35,000 feet. One thing for sure is that this is just the beginning of such extreme measures to obtain petroleum. It was the deepest oil well in history. How do we get legislators on all levels, local, state and federal, to endorse Ekson Exhilaration? We as a society have to make it clear to politicians of all party affiliations that we will vote for them only if they support the hydrogen infrastructure plan. I used to work on an Ojibwa Indian reservation. Once, during a heated election for tribal council I said to one of my friends who was a tribal member that I did not think Native Americans would have any divisiveness among tribal members concerning an election. He told me that council members make almost $100,000 a year, and that the chairman makes over that amount. He said tribal politics could give Chicago politics a run for its money. Politicians do good and bad things depending on where you stand on the various issues. The bottom line is that politicians want ,above all else, to be reelected. When it comes to environmental degradation caused by the petroleum economy, I could go on and on. Did you ever spend any time in Los Angeles? I have. I lived there for four years. Most of the time the air was a brown, toxic soup. In Chicago, where I grew up, there are ozone alerts during the summer. Just about every major city in America has air pollution. Do a Google search, and you'll find millions of results on air pollution and its environmental effects. Our society has made great strides in reducing tailpipe emissions, only to have that negated by the increased number of cars and miles traveled per person. Also, there is still the ongoing serious problem of petroleum runoff into our waterways. With the building of Ekson Exhilaration we can eliminate most of the petroleum based pollution from our environment. Ozone and particulate matter are just two types of atmospheric pollution. There is also the matter of carbon dioxide. Petroleum is a hydrocarbon, i.e. a combination of hydrogen and carbon. When a hydrocarbon is burned (oxidized), it is split in two with the carbon becoming CO2 and the hydrogen becoming H20. So, you get carbon dioxide and water vapor. The problem with carbon dioxide is the well known greenhouse effect. This is the prime cause of our current off-the-charts global warming. On the other hand, burn hydrogen, and you get H20....water vapor. No problem. We hear how Wall Street has not been keen on investing in wind or solar energy. 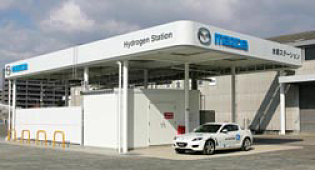 With the building of the hydrogen infrastructure the incentive to invest will pick up. Once the sheer scale of Ekson Exhilaration is established, with its hundreds of thousands of wind turbines and solar panels, Wall Street will want in on the action. Instead of a boom and bust market based on speculation and getting in on the bubble before it bursts, the national hydrogen infrastructure will be based on steady growth at the rate of $1 trillion every 4 ½ years. This growth will continue for thirty to fifty years. WIN: Energy providers get to reduce the environmental equation of doing business. Energy providers get a new state of the art hydrogen infrastructure paid for by citizens . good will and citizen approval resulting in higher stock prices. Energy providers will have increased profit through efficiency. WIN: Politicians who support Ekson Exhilaration will be assured of reelection. Congressional approval ratings will rise above the current dismal 11%. The "Do Nothing Congress" label will be lifted. The Congressional legacy will be cemented in history as "The Green Congress" . Citizens will begin to trust their legislators again. WIN: The citizens will finally get the clean energy they have been asking for. Many millions of green jobs will be created. A cleaner environment will mean a healthier population. Wall street will have a tangible investment that is long term. Our society will secure our energy future for our children and grand children, down through future generations. By The Numbers: Can We Afford to Build The Hydrogen Infrastructure? Some people have said there is no way our society could even begin to afford building Ekson Exhilaration (the national hydrogen infrastructure). With our government $19.8 trillion in debt and a downturn in our economy since the Wall Street crash of 2008, the money simply is not there. I beg to differ. Here, then, are some of the numbers that show just how we as Americans spend our money. The enacted budget contained $2.469 trillion in receipts and $3.796 trillion in outlays, for a deficit of $1.327 trillion. This federal budget and deficit is just the tip of the iceberg. $15.5 trillion United States national debt. There is no end to what is considered discretionary / disposable spending in America. Some will say that is a huge segment of our economy, and all this spending represents jobs. I will agree that all this spending does represents jobs. I guess for me it comes down to priorities. What is important? More stuff and entertainment, or securing our energy future? Since Ekson Exhilaration is a grass roots movement, there are designated areas in which people can donate their time and energy. Green volunteers will conduct fund raising events; recruit other people to join Ekson Exhilaration; coordinate organization events and fund raising efforts; recruit people to exercise oversight of spending based on consumer groups; work on acquiring areas to put wind turbines and solar panels from local, state, and federal government entities. Volunteers will donate time to run the national Wind Park on the North Dakota/South Dakota border. Volunteers will manage the National Solar park. Green contributors (either individuals or organizations) are those who give time or money to building the national hydrogen infrastructure. For example, if Toyota could donate $900,000 to the National Wind Park they would then have their own wind tower with their logo and advertising on it. This would make sense since Honda is the leader in hydrogen automobiles with its Clarity fuel cell car. Another example would be a media outlet donating money to build a wind tower for the national Wind Park. They could have their logo on the wind tower, put the history of their company on display, and have memorials to past great employees who have contributed to make the network what it is today. The media outlet could also have any area of the wind tower dedicated to advertising, and donate air time in the form of public service announcements. These public service announcements would raise public awareness of the building of the national hydrogen infrastructure and ask for donations. Individuals could also have their image, message, and advertising on their wind tower. As the number of wind towers manufactured grows, the costs will fall due to economies_of_scale. This strategy will also be applied for the national Solar Park in the southwest of the United States. Volunteer green lobbyist – Volunteers will lobby local, state, and federal governments for support in building Ekson Exhilaration. An example of a volunteer doing such an activity would be going to county board meetings and asking for support in the form of donating county land on which to put wind turbines and solar panels. Volunteer Green Lobbyist efforts could be done on individual and group basis. They could also ask county board members for a special half percent county sales tax specifically designated for that county's contribution to the national hydrogen infrastructure. The money raised in that specific county would stay in that county. The Volunteer Green Lobbyist will lobby state legislatures for support of Ekson Exhilaration. They will ask state legislatures for comprehensive long term plans for their part in the national hydrogen infrastructure. The Volunteer Green Lobbyist's will ask for the states to donate land to install wind turbines and solar panels. The Volunteer Green Lobbyists will ask the legislatures for tax breaks for individuals who donate land on which to install wind turbines and solar panels. They will also ask for a special tax to be spent only on that state's effort towards the national hydrogen infrastructure. The Volunteer Green Lobbyist will ask state legislators to start massive recycling programs specifically aimed at getting metal, plastics, and rare earths for the manufacturing of wind turbines and solar panels. The end result would be to get these materials for free from the public to lower the manufacturing cost of hundreds of thousands of wind turbines and solar panels. We will be asking to legislators to sponsor fund raising events on their state's public television and radio stations. The Volunteer Green Lobbyists will ask Congress to support Ekson Exhilaration. They will ask Congress to designate the National Wind Park on the North Dakota/South Dakota border as a federal park. They will ask Congress for hydrogen infrastructure-specific recycling including rare earths. These recycled materials will go exclusively to Ekson Exhilaration for the building of wind turbines and solar panels. They will ask Congress for federal designation of the National Solar Park. This park will be built on the California, Nevada, and Arizona border. They will ask Congress to give tax breaks to anyone contributing money, land or materials to the national hydrogen infrastructure. Congress will determine the amount of tax breaks. On the other hand, time donated will not be tax deductible, because this will considered to be the duty of American citizens. The volunteer green lobbyists will ask of congressional oversight of the entire thirty to fifty year project. They will also ask for strict financial oversight. The financial oversight will be coordinated with two other separate volunteer groups. The purpose is to have exact accounting for every penny donated at all times. We will ask Congress for donations of federal lands on which to put wind turbines and solar panels. The volunteer lobbyists will ask Congress for an optional donation sales tax to go solely for the purchase of materials for Ekson Exhilaration. If you do a Google search for hydrogen infrastructure you will get millions of results. There is much information on the Internet about the subject. Many plans have been formulated including plans from the United States Department of Energy. What is lacking is a long term plan that involves all citizens of our country. The starting point will be the National Wind Park. This federal park will be on the North Dakota/South Dakota border. This area has long been called "the Saudi Arabia of wind". 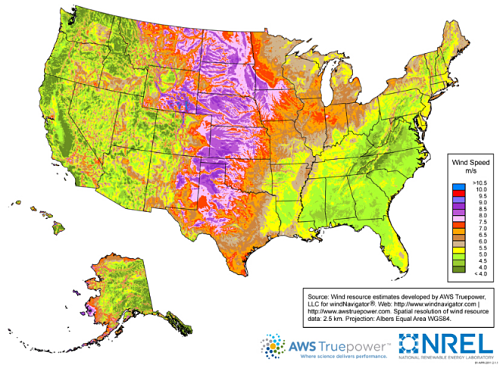 In fact, by checking the wind maps of the United States you'll see that all the Great Plains states have much potential for wind power. 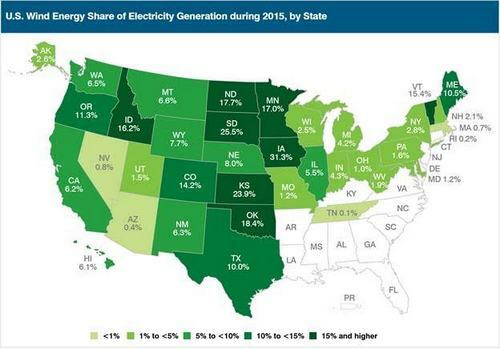 Texas now leads the country with the most energy produced from wind power. The goal for the National Wind Park is to erect 15,000 wind turbines in the next thirty to fifty years. This will require installing a phenomenal 300 to 500 wind turbines a year. For Ekson Exhilaration to work we have to plan big. One way to keep costs down will be to start building wind turbines in the Great Plains states. Part of the big cost of wind turbines is transporting them to the sites they will be erected. Building the wind turbines close to the sites where they will be erected will create much needed jobs in the same area. It will also keep costs down. Another aspect of Ekson Exhilaration will be the building of the hydrogen grid from rural to urban, rather than the other way around.. In the rural areas of America there is much more open space for wind turbines and solar panels. We will build toward the urban areas so that when the urban areas are connected to the hydrogen grid there is enough infrastructure in place to support the urban population. One of the great things about hydrogen is that it can be stored for later use when the sun is not shinning and the wind is not blowing. Furthermore, unlike electrical energy being stored in batteries that diminishes over time due to self discharge, hydrogen in its gaseous state (barring any very minor leakage) being stored in a tank is there forever. It requires considerable external energy to compress the hydrogen to the optimum pressure of 5,000 pounds per square inch (PSI). Then it must be contained in a very heavy duty tank. However, this is not true of liquid (cryogenic) hydrogen, which can be contained at a pressure of only thirty PSI. However, it must be maintained at a temperature of -423 Fahrenheit, which requires a specially insulated tank with a wall that is the equivalent of fifty feet of ordinary Styrofoam. If it warms to any degree it must be vented or the tank will explode. Both forms of hydrogen storage involve energy losses, but there are a great many advances happening in the field of hydrogen storage. Poised to eclipse the current methods, these include: reversible metal hydrides, carbohydrates, synthetic hydrocarbons, ammonia, amine borane complexes, formic acid, phosphonium borate, and carbonite substances. 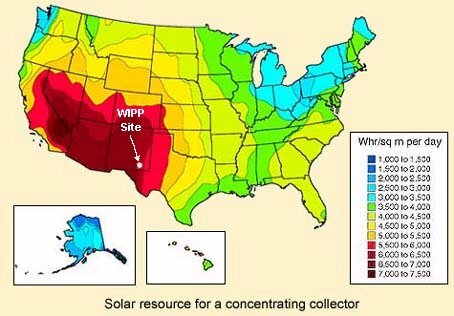 The point to having a National Wind Park and a National Solar Park is to have definitive starting points. These parks will be the flagship renewable energy parks of Ekson Exhilaration, and serve as templates for other parks across the United States. Every state will have much smaller versions. The car Jay Leno drives in this YouTube video is a hydrogen/gasoline powered internal combustion hybrid. We will need cars like this for decades as we switch over to an all hydrogen infrastructure. Some areas of the country will get the hydrogen infrastructure before others. 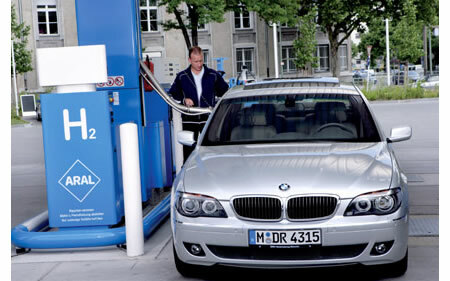 With a hybrid fuel automobile, when someone drives out of an area served by the hydrogen infrastructure, they will be able to fuel up with gasoline. Hydrogen vehicles have been around longer than you might think. The very first one was built in 1807! (No, that's not a typo.) A Hydrogen Fuel Cars website tells the story. CLICK HERE. There is also a Hydrogen Cars Forum. CLICK HERE. 1. All materials for the building of the hydrogen infrastructure must be American made and come from United States. No foreign made materials may be used. 2. All wind turbines, solar panels and pipelines must be American made by workers from the United States. No imports of any component parts for any part of the hydrogen infrastructure. 3. All construction workers building the hydrogen infrastructure must be United States citizens with a social security number. No outsourcing allowed ever during the entire thirty to fifty year project. 4. All workers for Ekson Exhilaration no matter what their position must be a American citizen. No out sourcing of any job that is part of the national hydrogen infrastructure. One of the main points to Ekson Exhilaration is that it is a 100 percent American made hydrogen infrastructure. We keep hearing all the time in the news about how we need jobs in our country. These will be good paying, real, long term jobs. Building the hydrogen infrastructure is a job millions of Americans will be proud of. Working for Ekson Exhilaration will be an exciting career and one of pure happiness, knowing that they are working on a thirty to fifty year project that will change human evolution and leave the world a better place for their children and grandchildren. People will be donating their time and money to make the the national hydrogen infrastructure happen. This is why it will be purely American made. Petroleum is a finite resource. Easily and cheaply extractable oil and gas is quickly becoming a thing of the past. Obtaining the remaining hydrocarbons will be ever more expensive, difficult and dangerous. This phenomenon goes by the name peak oil. We are entering uncharted waters in the matter of global warming caused by the burning of fossil fuels. Our actions at this time cannot be retracted. Climate-induced crises could topple governments, feed terrorist movements or destabilize entire regions, say the analysts, experts at the Pentagon and intelligence agencies who for the first time are taking a serious look at the national security implications of climate change. The costs of increasing severe weather events are likely to have a drastic effect on insurance rates, and on the financial health of the gigantic insurance industry itself. Pollution of land, sea and air due to the use of petroleum is simply a colossal waste of resources that we cannot afford to have continue. An undertaking of this scale would inspire and unite America's citizenry like our space program once did. Some people will ask why I am not putting more emphasis on global warming/climate change in regard to the national hydrogen infrastructure. Rather than take up pages of writing about the subject I will say this. Dig real deep when you read or hear any information about global warming/climate change. Follow the money. Find out who is paying for the scientific study on climate change whether the report is pro or con. Find out what the research is based on and where the information comes from. Read and listen to as much information from as many sources as possible. Peel back the layers of information and cross reference that information. Look for the worldwide scientific community's opinion on global warming, the research and studies that back their opinion. Continue to follow all new information, studies, research, funding, on global warming/climate change. Citizens United “ now that corporations are people"
In January 2010 the United States supreme court handed down a ruling allowing corporate entities the freedom to spend as much money as they like supporting political candidates. They can also spend as much money as they like attacking political candidates they do not support. The Citizens United ruling is just the latest in a long line of rulings spanning two centuries that have supported the evolution of corporate personhood. I say now that, because corporations have been deemed to have the rights of natural people by the Supreme Court, it is time they start acting like people. Before personhood, corporations' only function in life was to make a profit at any cost. Whether it hurt the environment, delivered inferior products, took advantage of workers, cut jobs for short term gain, or outsourced jobs for cheap foreign labor, it was all an accepted way of doing business. Now, with corporate personhood, it is an unacceptable way of operating a business. A person looks out for the environment, cares about making the best products in the world for other people. A corporate person would never take advantage of another human being, cut a person's job to increase the bottom line, or outsource another person's job. As citizens, we must now hold corporations accountable for their actions. Corporations that do not follow the new ethic of personhood can expect to be boycotted and have social media work against them. If necessary, acting through our government, we citizens can also revoke corporate charters for irresponsible actions that are not in the best long term interest of the public. That is how it was in the early days of the United States of America, before the Supreme Court began bending to the will of the monied interests' centuries-long legal assault. There should be no limit to a corporation's liability for environmental, social or economic damage. This is why it is important to build the national hydrogen infrastructure for the energy providers of our nation. By building Ekson Exhilaration, we the citizens will set the example of responsibility for corporate America. To do this, Ekson Exhilaration will be a federally chartered public benefit corporation like the Tennessee Valley Authority. Once when we had a severe cold snap in the north woods, I drove the clinic's van to the Twin Cities with a client who needed surgery. While I did that, my van sat outside clinic for three days. During that time it never got above zero, and at night the low temperatures were around thirty below. Upon our return, it was 9 pm and the temperature was minus 26. I was sure that my van would not start after sitting in the bitter cold for three days. I turned the key, and the starter cranked very slowly. Then, to my amazement, it started, making a strange groaning sound. I turned on the heat and went inside the clinic while it warmed up. After about 20 minutes I got in, and it was completely warm. Turning the radio on, I drove the 36 miles to my home. Let me tell you, I was never so happy in my life to be burning gasoline. I love my car and how it gives me freedom to go where I want, when I want. We Americans do love our cars. There are 247 million registered vehicles in the United States in 2012. Our cars take us where we want to go, and protect us from the environment when the weather is severe. We need our cars to survive, just as we need electricity to live a comfortable life. Now, in the 21st century, our cars and electric usage are both taking a toll on the environment that sustains us. Our modern life doesn't have to wreak havoc on our environment. The technology already exists to both keep the modern life we love, and have a clean environment that sustains life. Now, in 2012 we start the social movement called Ekson Exhilaration. This is a people's movement, created to put into place the technology that already exists to give our society a clean, sustainable future. Like you, I love modern life and all the comforts that come with it. It is up to all 313 million of us to make the national hydrogen infrastructure a reality. Our society has a history of boom and bust cycles in the economy that has gone on for centuries. It is all about cashing in on the next bubble before it bursts, whether it is the commodities market, savings and loan debacle, internet tech bubble of the late 90's, private equity firms bubble, or housing bubble of the most recent decade. These are just a few of the bubbles that people have cashed in on. Now we can look forward to the bursting of the $600 trillion derivatives market bubble. This will enable the privatization of everything public in our society, including Social Security and Medicare. When that bubble bursts what will be left? This is all the more reason why we as a society need to build Ekson Exhilaration (the national hydrogen infrastructure). Large infrastructure building projects are what make America great. Whether it is our great cities, the interstate highway system, our bridges, the great dams of the western United States, the railroads, NASA, our universities, suburbia, the electric grid, the National Park system, the sewer and water systems, the petroleum grid, the St. Lawrence Seaway, the Panama Canal, or the aviation infrastructure....each one of these elements contributed to our country's status. What they all have in common is that they represent real jobs and progress. When the workers were done constructing the Hoover Dam they looked up in amazement and total pride. This is the same kind of amazement and pride that will be felt during and at the finish fifty years from now of Ekson Exhilaration. After 911, the Iraq War, the Afghanistan War, and the economic crash of 2008, Americans are weary. The building of The national hydrogen infrastructure is the kind of project we need to help heal our national soul. There will be no outsourcing, bailouts, leveraged takeovers, buyouts, speculation, layoffs, foreign made components, scams, or corruption for a quick buck. By building Ekson Exhilaration we will be going back to what we do best in this country: planning and building great projects. The national hydrogen infrastructure will be the largest and longest lasting project in human history, and the most expensive project at $11 trillion over a fifty year time period. It will require the largest fund raising event ever, lasting fifty years. It will take several generations and every citizen's participation to make the national hydrogen infrastructure a reality. Ekson Exhilaration (the national hydrogen infrastructure) will eventually be a boon for all energy providers in the United States, even the owners of our aging, out-of-date nuclear power plants. As of 2012 there are currently 104 operating nuclear power plants in the United States. Many of them are at the end of their useful life, waiting to be decommissioned. It will take 3,000 wind turbines to equal the output of one nuclear power plant according to most calculations. That comes to 312,000 large wind turbines to equal just the power turned out by nuclear means. Then there are the environmental costs of nuclear power, including storage of nuclear waste, decommissioning all those plants and, most frightening of all, accidents. This was all too evident with the recent Fukushima nuclear crisis. When taking all of this into account, it is clear that a better path would be hydrogen power plants with fuel made from renewable resources. Of course, no industry is just going to roll over and cease to exist, especially the nuclear industry. This is why we as a society have to guarantee the resources for a conversion from nuclear to renewable energy. Some will say that this is to high a price to pay, but I would say we are already paying that high price. Neither will the coal industry just roll over and go away. They have highly paid lobbyists to make sure Congress passes laws which subsidize their existence. In the state of Kentucky, 1 % of jobs are related to the coal industry. In West Virginia, the coal industry represents 5 % of the work force. It is imperative that anyone working in the coal industry has a guaranteed replacement job. How can our society expect people who rely on this industry for their livings to give up their jobs for the benefit of the planet's atmosphere? It used to be that obtaining oil and gas was as easy as poking a pipe into the ground. The gas pressure forced the oil to the surface in the familiar "gusher" phenomenon. Pipelines were then used to pump the drilling products to refineries and on to consumers. A lot has changed since then. The easy stuff was used up a long time ago. Wells got deeper and deeper, and became located in more and more remote places. New methods were developed, like slant drilling and the use of off shore drilling platforms. Along the way, it was discovered that deposits of gas and "tight oil" locked up in dense formations could be freed up by drilling, followed by high pressure hydraulic pumping which injected water, sand and solvents to break up, or fracture the substrate rock. This method has become very common in the last decade, as have concerns over ground water pollution, released methane's greenhouse effect, earthquakes and the impact of mining the silica sand vital to the process. So how does our society get the petroleum industry, the nuclear industry, the coal industry, and the natural gas industry to change over to clean technologies? To change to the hydrogen infrastructure! The answer is we as a society don't get these industries to change to the hydrogen infrastructure. The bottom line is there is too much money to be made by corporations with the status quo. Even if the citizens of our country agree to build the national hydrogen infrastructure and give it to the Energy Providers they would never accept it for fear of change. In some cases there is generations of ownership in energy companies. These owners are not going to change a good thing even if it meant they were still the controlling owners. Even with the petroleum industry's numbers down since the 2008 down turn in the economy, there is little hope of change. The industry would enjoy sustained growth with the building of Ekson Exhilaration and with that would come much increased profits. This approach will take much more effort on the part of our citizens. It will take a longer time to build the national hydrogen infrastructure without the participation of the large energy providers in our country. There will also be obstruction to building Ekson Exhilaration from the energy conglomerates in the form of intense lobbying. Now that corporations are people they can spend as much money as they want to influence the outcome of elections. Of course they will back any person running for elected office that supports the status quo regarding the energy sector of our economy. Another thing the energy cartel uses to maintain the status quo is the American Legislative Exchange Council ( ALEC). It is a faux non-profit educational organization made up of state legislators and representatives of big business. ALEC is, in fact, a lobbying organization wherein moneyed interests feed model legislation crafted by their attorneys to receptive state legislators. They have hundreds of so-called model bills on the shelf, designed to obstruct the renewable energy market, tame global warming initiatives, and deregulate environmental standards that are already in place as settled law. So it comes down to a battle of wills. Keep things the way they are or make the gradual fifty year change to the hydrogen infrastructure. It is ultimately up to us, the public. We hold all the cards. As we know from our history there is nothing our country cannot do when all Americans are behind it. Whether it is winning World War Two, building railroads across the country, building the interstate highway system, the moon landings, when Americans come together on a project, the job gets done. So it will be with Ekson Exhilaration. I hope you have enjoyed reading this as much as I have writing this. Together we will build the national hydrogen infrastructure.